New York: It was not expected to happen but Juan Martin del Potro did not care. The Argentine left Roger Federer, and the rest of the tennis world, stunned as he subdued the five-times champion in a pulsating five-set final to claim the US Open crown on Monday. Standing tall at 1.98 metres (6-foot-6), the Argentine skyscraper left Federer trailing in his shadow as he won an action-packed 3-6 7-6 4-6 7-6 6-2 battle to capture his first grand slam crown at a floodlit Arthur Ashe Stadium. After being gifted his third match point with a double fault, an incredulous Del Potro kept his eye on the ball as he watched a Federer backhand float long to seal victory. He dropped his racket and collapsed on to his back, with legs splayed and his hands covering his face, an X-shaped emblem of triumph. With his body still shaking with emotion, Del Potro got back on to his feet as the tears started to flow freely. “I had two dreams this week. One was to win the US Open and the other one is to be like Roger," the 20-year-old Del Potro told the cheering crowd as he picked up a cool $1.85 million for his run in New York. Then turning to his victim, the sixth seed added: “One is done but I need to improve a lot to be like you. You fought until the final point; you are a great champion. “I’m very happy to be here with this crown, with these people, on this court... this will be in my mind forever." French Open and Wimbledon champion Federer, who had been bidding for a 16th grand slam crown in a final that had been pushed back to Monday, said: “I had a great tournament but he was the best." The victory allowed Del Potro to become the first South American man to triumph in New York since compatriot Guillermo Vilas in 1977. But unlike 22 years ago, Del Potro was not mobbed on court by dozens of fans who wanted to get up close and personal with a champion. Instead, Del Potro poured cold water all over his head to ensure he was not dreaming this moment. The Argentine capped his incredible Flushing Meadows journey by becoming the first man to beat Rafael Nadal and Federer back-to-back in a grand slam arena. For Federer, it was a case of so close, yet so far. “I was two points from the match today. That’s the way it goes sometimes. But I’ve had an unbelievable run (this year). “Being in all major finals and winning two of those, I’m losing the other two in five sets. “Sure, I would have loved to win those two as well. But the year has been amazing already. Got married and had kids, don’t know how much more I want." On court, though, Federer can be a very greedy man. After romping through the opening set, Federer stood two points from taking a two-set lead at 5-4 but watched in horror as a Hawk-Eye overrule handed Del Potro break point. Convinced the ball-tracking system had picked up the wrong mark, a clearly irritated Federer dropped his serve as the set swung Del Potro’s way. He roared through the tiebreak 7-5. “Come on, you are allowed two seconds to challenge, the guy takes 10," Federer yelled at the umpire as he walked to his chair. “Are there any rules? That was way too long." 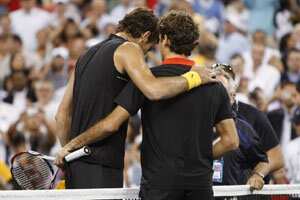 Told by umpire Jake Garner to be quiet, Federer uncharacteristically swore as he snapped: “Don’t tell me to be quiet. I’ll talk when I want to talk. I don’t give a ... what he says." Fired up by the exchange, the Swiss punished a luckless Del Potro in the next game. Serving to stay in the set, Del Potro missed an easy smash to go 0-15. On the next point he saw a Federer forehand slice bounce on the tape and fall dead on his side. Federer held up his hand to apologise but the Argentine rolled his eyes as if to say "You cannot be serious!" Two double faults later, the set was over. But the Del Potro forehand, which proved so devastating in the second set, was once again blazing winners in the fourth and the way he kept spanking the balls brought the crowd alive. Leading 3-2 with a break, he ended a fast-paced 21-shot rally by curling a forehand in on the run and as the ball dropped in, he kept on running to exchange high-fives with cheering fans in the front row. But just four games later, Del Potro was left gasping as Federer stood two points from victory. An ace and a forehand thunderbolt got Del Potro out of trouble and he pumped the air in delight. Fifty six minutes later, the Argentine was lying flat on his back. For Federer it ended an amazing reign in New York that had spanned 40 matches.